In a digital-first news landscape, journalists are providing instant content on social media while simultaneously producing in-depth coverage. It may seem impossible to balance the need for expediency with the desire for enterprise storytelling, but these two things are not necessarily in conflict. During a recent seminar by The Poynter Institute, Justin George of the Baltimore Sun (who also makes an appearance on the Serial podcast), was featured. He shared interview skills he’s gained in his time as a crime reporter and explained how social media can act as a modern-day notepad to report stories more deeply. 1. Always be in control. There is a power dynamic between the reporter and their subjects that needs to be navigated carefully. Before getting in to the interview, know where you’re going and what you want to get out of it. Keep control by creating appropriate boundaries. In conversation with your subjects, be firm and persistent, but also professional. Make sure they know you’re there to provide a service. You’re there to tell their story. 2. But, get out of your own way. A reporter plays a very important role in storytelling. But, “it’s not about you,” says George. Be an active listener and let the people you interview finish what they have to say. Avoid “gotcha” moments, by shutting off your internal dialogue and letting them speak naturally. You can guide your subject in a certain direction with your questions if you feel they are holding back. But, don’t drive them to specific answers. Take the time to know your subject. It will help your readers better understand the event or newsworthy decision you are covering. 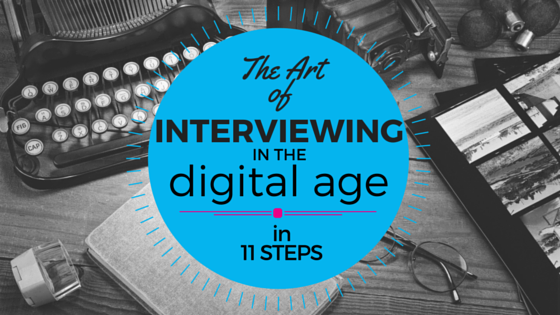 If you have time, retrace the person you are interviewing to capture their personal story arc. Talk with them about their childhood, their parents, and their interests growing up – anything that will give you background that could explain who they are today. Ask them to share photo albums and tell you stories from beginning to end. It will help you paint a picture and corroborate timelines. According to George, this is the golden rule. Be kind and respect their circumstances. Whether they are the victim, a spokesperson, a murderer, or lying politician, they are likely facing challenges or going through a difficult time. Treat them how you want to be treated, no matter what. By being polite and truthful, your subjects are more likely to open up and stick around. People are made up of anecdotes. You’re probably never going to fully capture someone’s personality, George says. But, with the right questions you can obtain cues about who they are, without compartmentalizing. For example, ask your subject if they keep anything in their pockets, what their tattoo means, or if they have a nickname. As George explained, little questions can provide big answers by acting as an entryway to greater truths. “Sometimes the most mundane detail is the most sublime,” he says. In some cases, the people you interview may recall something traumatic – and it could be shocking to you. Most likely they are already bracing for your reaction, so be sure to stay even and do your best to provide normalcy. It’s okay to tell someone, “I appreciate how difficult this is for you”. But, when you react, commiserate, or play up sympathy, you risk losing control of the interview and potentially shaming your subject. Using The Jinx’s final moments with Bob Durst as an example (don’t worry, no spoilers here), George reminded of the importance of staying tuned in. Talking is cathartic. Your subject could reveal critical information in a moment of golden silence, underscoring the journalist’s role as audience member when interviewing. Always let your subject have the last word. 8. Use email as a way to follow up. If your subject wants to think about their answers or needs more time, email exchanges can be a good way to get more detail. Your subjects may still be processing what’s going on around them. Email responses can provide a comfortable solution for them to tell the story, preventing hasty responses that could be taken out of context. If you want to stay in journalism, you have to make technology work for you, says George. Take pictures of your surroundings and of pictures people show you. This will allow you to go back and study the visuals to provide an accurate, detailed account of what you saw. For your interviews, ask permission to record on video or via voice memo. It allows for quick transmission back to your newsroom and the ability to re-listen for accuracy when sharing quotes. This is especially critical when it comes to high-stakes storytelling. 10. Share moments throughout the reporting process. More and more people are continually connected to their phones and social, due to a Fear of Missing Out (a.k.a. FoMO). Because of this, news organizations want to be the first to report the news on social. While reporting, use everything you have (e.g. Instagram, Facebook, Twitter, Periscope, Vine, and Snapchat) to share visual glimpses of your coverage. These small moments provide instant gratification to your viewers and instant news for your colleagues and superiors. They are also good teasers for your upcoming story. 11. Use social media as a library. Social media is a digital archive – use it to collect sources, contacts and information. What others are sharing on social may provide the context you were looking for in your reporting or offer an easier path to a person of interest. Create a private Storify to easily keep track what people are saying. You can reference the information later as you start writing. If you’re looking for another way to find sources, try ProfNet – it can help you find the subject-matter experts you need for your reporting. The best part? It’s easy and free to submit a query. Start your search now: Send a query.